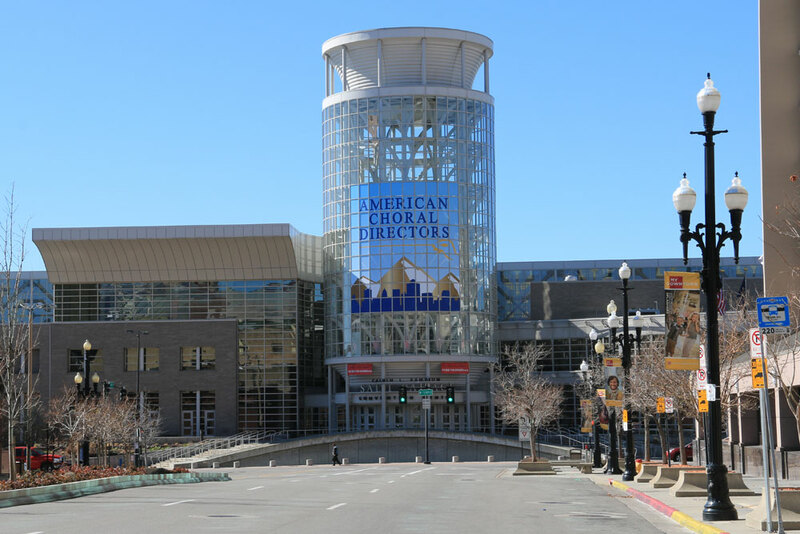 I recently had the opportunity to attend the American Choral Directors Association (ACDA) National Conference in Salt Lake City. According to ACDA Executive Director Tim Sharp, the 2015 event set attendance records, attracting 5000 delegates and 5000 choristers, not only from the USA but from 40 countries across the globe. This is a choral music event on a grand scale! Spread across four days and six venues, the conference featured concerts by American and international choirs, interest sessions, reading sessions, roundtables and industry showcases. An integral part of the conference is the opportunity for individuals, companies, institutions and organisations with a link to choral music to come together in one large exhibition space to display their offerings to those attending the conference. As in previous years, my publisher, Edition Peters, was one of the 135 exhibitors and I was grateful for the opportunity to be a part of the Edition Peters team along with Roger McClean (President, EP New York), Marissa Coté (Marketing Manager, EP New York), and Robin Tyson (Head of Artist Management, London). Sharing the stand with Peters was Musica Baltica, a publishing company based in Lativa, which is represented worldwide by Edition Peters. This year they were featuring, in particular, the music of the very popular young Latvian composer Eriks Esenvalds. Amongst the new releases from Edition Peters were two anthologies of pieces for mixed voices from the Choral Vivace series to compliment the two anthologies for Upper Voices that were released in 2013 at ACDA in Dallas. Throughout the Conference, reading sessions and industry showcases are presented by many of the publishers and also by notable people focusing on a range of choral music performance and ensemble categories. The very popular Edition Peters industry showcase was lead by Ben Parry in company with the members of the Chamber Choir of the National Youth Choir of Great Britain. Also extremely popular were the reading session and concert performances by Voces8, a group of young singers from the UK who are part of the Edition Peters Artist Management Program. With my very limited ‘free time’, I didn’t get to attend too many of the huge number of concerts on offer. But there was no way I was going to miss out on hearing the Mormon Tabernacle Choir. The 360-voice choir, accompanied by the Orchestra at Temple Square and conducted by Mack Wilberg, presented a superbly crafted concert “With Cheerful Voice: An Evening of Sacred Song” which ran non-stop for 75 minutes and which the choir sang without music! Salt Lake City was my fourth ACDA National, having previously attended Oklahoma City (2009), Chicago (2011) and Dallas (2013). These events provide a significant opportunity for networking and immersion in all aspects of choral music creation and performance. If you’ve attended one you’ll know exactly what I’m talking about. If you haven’t, do yourself a favour and try to make it to one (or more). You’ll be rewarded with an extremely worthwhile and memorable experience. The next conference is 2017 in Minneapolis, Minnesota. Please take the opportunity while you’re here to check out the full details of the Choral Vivace Anthologies by going to the Anthologies Catalogue page. In future posts I’ll be telling you more about some of the most recent Choral Vivace releases that have been included in the Mixed Voices Anthologies and also about some of the significant members of the choral music community I caught up with.